Here is a little info on what is new at the Mountain Community Co-op in Eatonville. We now have fresh organic bread in the store on Friday and Saturday, baked at Copper Creek Restaurant in Ashford. It actually comes in Thursday late afternoon, so if you like it hot out of the oven that is the best time to get it. It is $4.65 a loaf. Last week, we had wheat, rye and spelt. On Saturday evening, we put the last four loaves in the freezer and they are currently available for sale frozen. Also available by pre-order are frozen berry pies – from Copper Creek as well. They are $19.95 each. This may sound expensive, but when you taste the pie….well, one good pie is worth more than a bunch of just ok pies. So if you live in Eatonville you can now order and pick up a Copper Creek pie right here at the co-op. We have High Mowing Organic Seeds for your lawns again this year, along with heirloom and open pollinated seeds for your vegetable gardens. Speaking of gardens, the Mountain Community Co-op is helping to start a Community Garden here in Eatonville, and as a fundraiser our piggy bank dressed up as a bunny for Easter. To help keep bunnies out of the garden and water to the garden, donations can be put in the bunny bank at the co-op. Mayumi, one of our co-op artists, always does a great decorating, so, even if you are not able to donate, you might enjoy seeing our cute bunny (piggy bank)! Birdhouses, apple boxes and plants are also starting to show up at the co-op. Plus, we still have local eggs and meat. We also found a new supplier for milk, so we again have a reliable source of organic milk from grass fed, pasture-raised cows. Although not raw, this milk is pasteurized; and it is also not homogenized, so the cream still comes to the top. We are still doing produce shares and also carrying more produce in the store. We also have lots of new products in the store and we are open to the public. We are still doing monthly sales, so check our web site for current in-store sale list and order guide for other sale items. For more information on sales, store hours, volunteer duties or any other issue, please click on our ad, which will take you immediately to our web site. 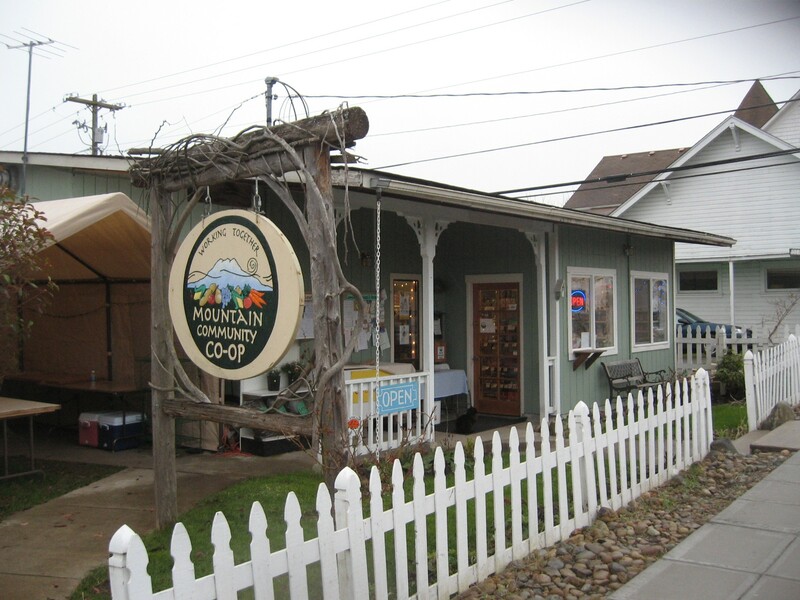 The Mountain Community Co-op is located on Carter Street, just west of the Eatonville Middle School. It is open to all, Mon-Sat, and volunteers get a discount on their purchases. A very important source for non GMO products. The health effects being discovered from GMO products makes the extra cost of organic foods cheap heath insurance. Indeed, Paul. The more I learn about cardiac health, I see that good food is the single best way to avoid a heart attack. Half of all Americans who will die this year will die by a heart attack. We have to be vigilant against the crappy junk that the American Marketing Machine feeds us. The Eatonville Co-op is in the forefront of protecting our food supply. I support them whole-HEARTedly.